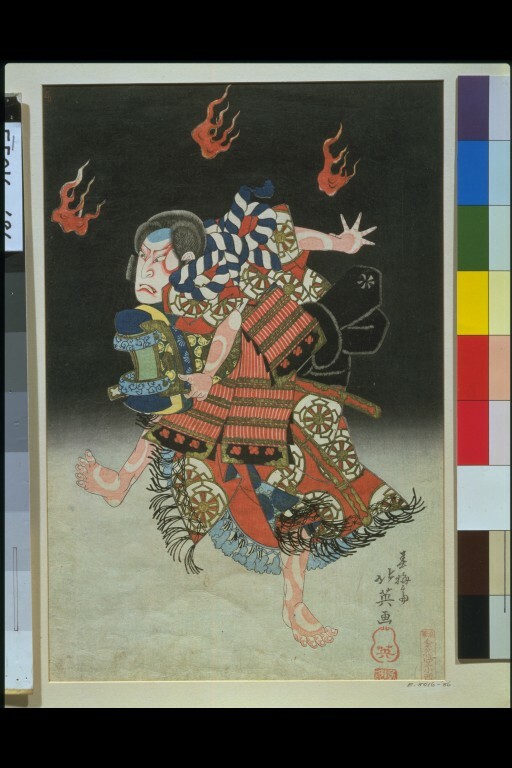 As evidenced in this work by the early 19th-century artist Hokuei, dramatic power and energy characterised the theatrical prints of Osaka. 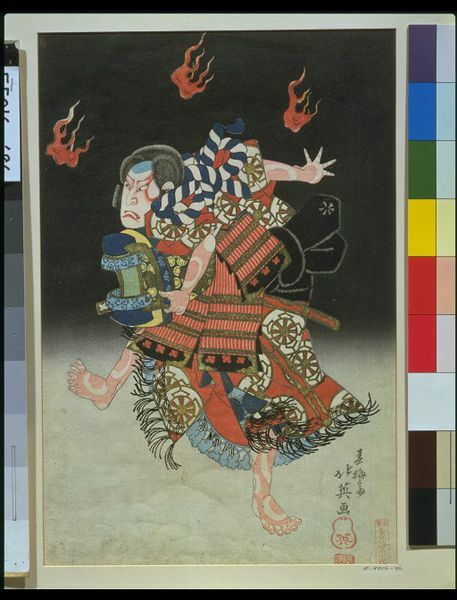 This particular design depicts the end of the Fushimi-Inari Shrine scene in Act 2 of a play staged at the Naka-za Theatre in Osaka in May 1835. The play seems to have been a version of the highly popular Yoshitsune Senbon Zakura (Yoshitsune and the 1,000 Cherry Trees). Yoshitsune parts with Lady Shizuka at the shrine and leaves with his party. A sorrowful Lady Shizuka leaves the stage, and finally Nakamura Shikan II as Tadanobu makes his exit by the hanamichi (walkway). Tadanobu here is actually a fox who will loyally accompany Lady Shizuka to Mt Yoshino. 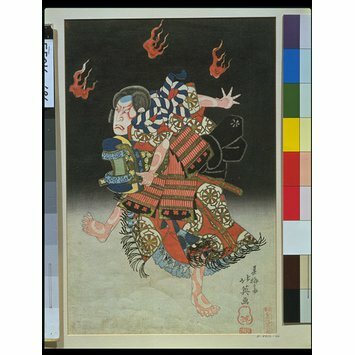 This print most likely depicts the end of the Fushimi-Inari Shrine scene in Act 2 of a play staged at the naka-za Theatre in Osaka in May 1935. The play seems to have been a version of the 'Yoshitsune senbon zakura' (Yoshitsune and the Thousand Cherry Trees). Yoshitsune parts with Lady Shizuka at the shrine and leaves with his party. A sorrowful Lady Shizuka leaves the stage and finally Nakamura Shikan II as tadanobu makes his exit by the hanamichi or walkway. Tadanobu here is actually a fox who will loyally accompany Lady Shizuka to Mt. Yoshino. Oban size. Signature: Shunbaisai Hokuei ga. Seal: Hokuei. Publisher: Kinkado Konishi.